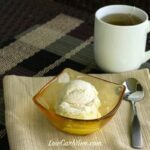 This is a low carb and sugar free homemade coffee ice cream without eggs in the recipe. It’s a creamy high fat ice cream that scoops well after freezing. I just love my new ice cream maker because I no longer have to freeze the container prior to using it. It’s got a built in compressor that keeps the ice cream mix perfectly cold during the whole cycle. The other great thing is that I don’t really need to chill the cooked ice cream mix first. However, I’ve still been using an ice bath to cool the mix down a bit before processing in the machine. 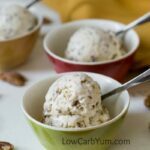 Ice cream is a big weakness of mine and I would often buy CarbSmart ice cream even though it has artificial sweetener in it and other nasty stuff that messes with my digestive tract. It was just so easy to buy ready made sugar free low carb ice cream. I’m happy to say that I have not bought pre-made low carb ice cream since getting the Cuisinart Ice 100 compressor ice cream maker! 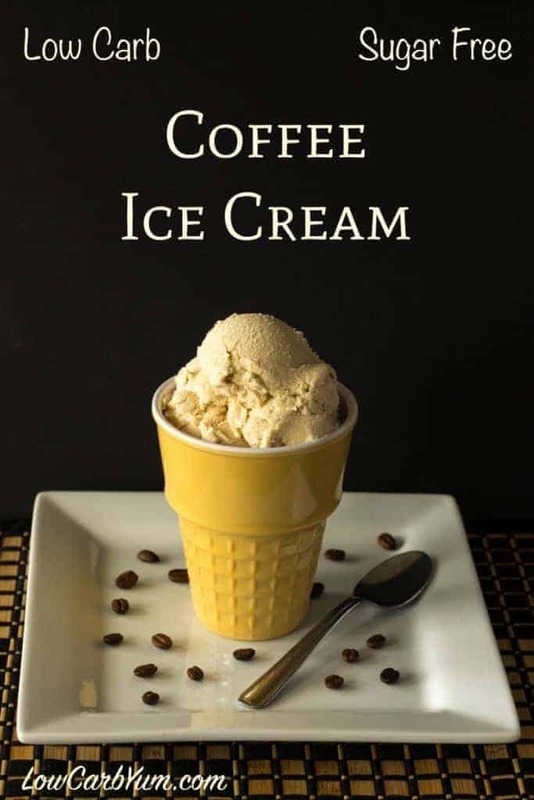 When I need flavors beyond chocolate and vanilla, this low carb coffee ice cream is welcomed. It’s been a while since I’ve made my own homemade low carb ice cream. 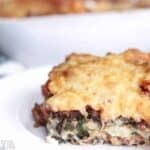 I’m working on improving the base recipe before I venture out to more exciting flavors with yummy add-ins. I’ve made four batches of low carb ice cream since buying a new ice cream maker and I think I have come up with a great base recipe. 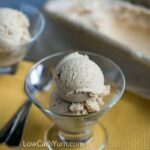 This low carb homemade coffee ice cream without eggs recipe is a variation of my vanilla bean ice cream recipe. 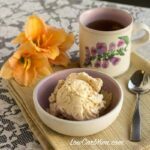 These recipes are based on the Jeni Bauer ice cream method which results in creamy and easy to scoop homemade ice cream with no eggs added. Sugar free ice cream tends to freeze harder than ice cream made with sugar. Some people add a non flavored liquor like vodka to the ice cream mix to keep it scoopable. I rarely drink alcholic beverages so I shy away from adding liquor to my ice cream other than the small amount in extracts. Storing homemade ice cream in a Tovolo ice cream tub container also helps prevent it from becoming icy in the freezer. 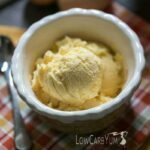 I have found that using a fiber based sweetener along with cream cheese and xanthan gum helps keep my homemade low carb ice cream scoopable. 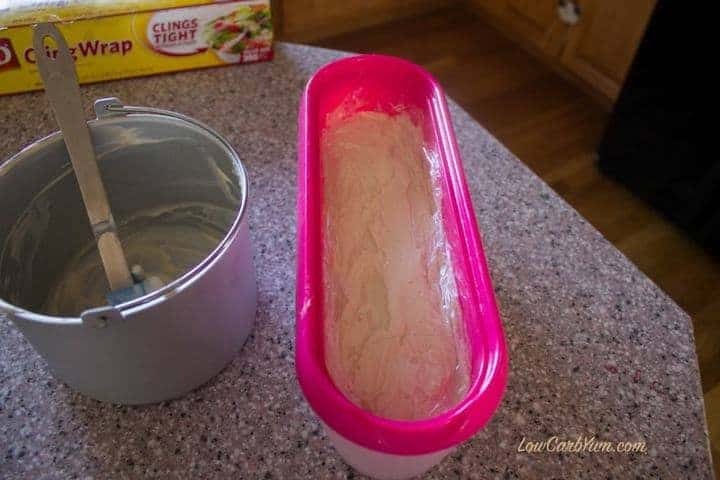 It isn’t scoopable immediately from the freezer like commercially prepared sugar free ice cream, but letting it sit out for 10-20 minutes allows it to soften to a scoopable texture. I know it’s difficult to wait, but this is a delicious treat worth waiting for. It’s even better topped with my low carb hot fudge sauce and whipped cream. Heavenly! 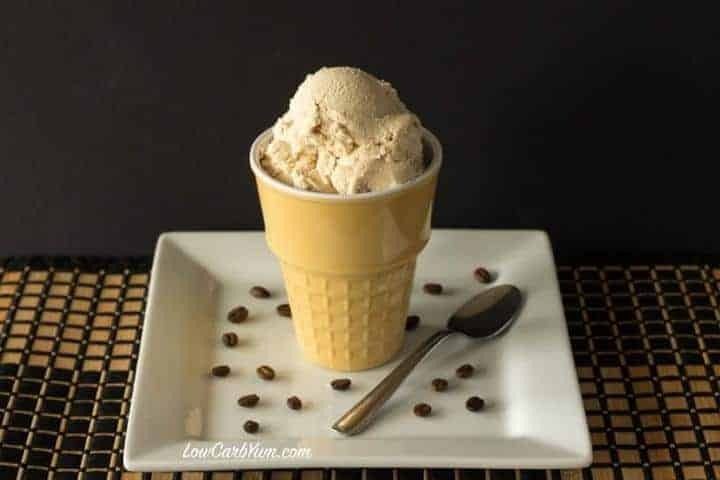 This is a low carb and sugar free homemade coffee ice cream without eggs in the recipe. It's a creamy high fat ice cream that scoops well after freezing. In a large saucepan, combine the brewed coffee, almond milk, heavy cream, VitaFiber powder, stevia extract powder, and VitaFiber syrup. Bring the milk mixture to a boil and cook over moderate heat about 4 minutes. 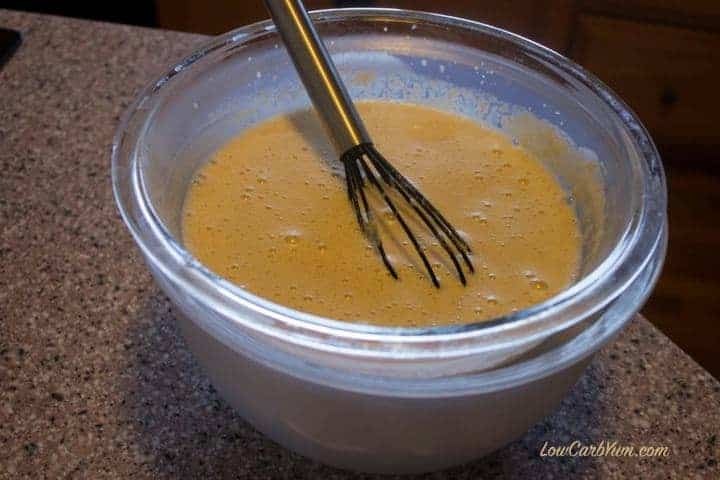 Stir in xanthan gum, coffee extract or powder, and vanilla. Can you make this without an ice cream frezzer?? It might be able to. 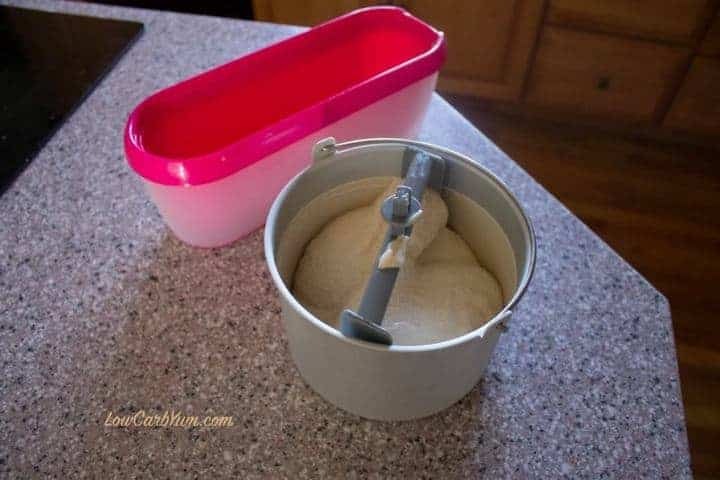 I find that whipping with an electric mixer help to get air in without churning. 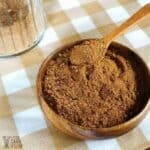 Chicory root fiber or inulin is a better sub and you’ll need less of it. What can used to replace the white sugar inulin? When I looked it up, it is sugar with inulin. 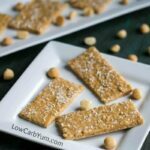 LC Foods white inulin sweetener is a low carb fiber sweetener. There is no sugar in it. You could use Swerve instead. Funny that I don’t like to drink coffee but I LOVE coffee ice cream! That is also an ice cream flavor that my husband and I can agree on! Thanks! It is odd that you like coffee flavored ice cream but not the drink. Maybe a good ice coffee could change that! Since it has coffee in it, totally acceptable for breakfast right?! YES! Totally acceptable in my mind. This looks amazing! But that’s a steep price for an ice cream maker….. I agree that the price of the ice cream maker was a little hard to swallow (I paid about $250), but I’ve been using it so often that I made counter space for it. I had the Cuisinart ICE-20 machine previously and although I paid under $50 for it, I rarely used it. The reason? I don’t have room in the freezer to store the canister and having to wait a couple days for it to fully freeze takes the fun out of making ice cream on a whim. This should be my first ice cream of the season! 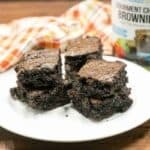 I’m already planning a second batch this week! I’m craving a lick of this right now! 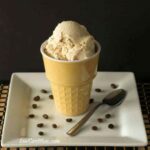 Recipe is for Coffee Ice Cream. Last sentence on step 5 says to put the vanilla ice cream in the freezer. Thanks! This is what happens when you are working with a crazy toddler in the background. Fixed. 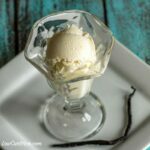 The recipe is adapted from my vanilla bean recipe so steps were copied and I missed an edit. It’s definitely deserving of a lick!